I REPEAT -- FREE. FOOD. You want to know what's better than food in general? Food that's free. Seriously. Free food ALWAYS tastes better. And turns out, there's a ton of places where you can get free food during the entire month of April. Before I ramble anymore, let's get to it. The Giant Junior Bacon Cheeseburger for a limited time, and you can get it as a combo meal -- with a four-piece chicken nuggets, small fries, and a drink -- for $5. The deal is ongoing, but for a limited time. Three fluffy pancakes for 89 cents or a 10-piece nugget for $1 offer. Three-piece of chicken tenders or bone-in chicken with a biscuit for just $3.99. Every Thursday, score a sweet deal on boneless chicken wings. The discounts will vary by location, but you can count on getting a deal any time of day on Thursdays. This deal happens every Thursday. 10-pack of Munchkins donut holes for just $2. The deal is only available for a limited time this month. Pair the Ultimate Lobster Roll and the Lobster Bisque for just $15 every Tuesday until 6pm through the end of Lobsterfest. This deal is only available for a limited time. The Domino's app will give you free pizza for just eating pizza. It doesn't have to be Domino's pizza. Just take a picture of the pizza you're eating and you get 10 points. This deal is available through April 28. When you buy a $50 gift card to Bonefish and you'll get a $10 bonus gift card for free. The deal ends June 16. Free Made From Scratch Sausage Biscuit between 7-10am and drop the phrase "Made From Scratch" at the counter. 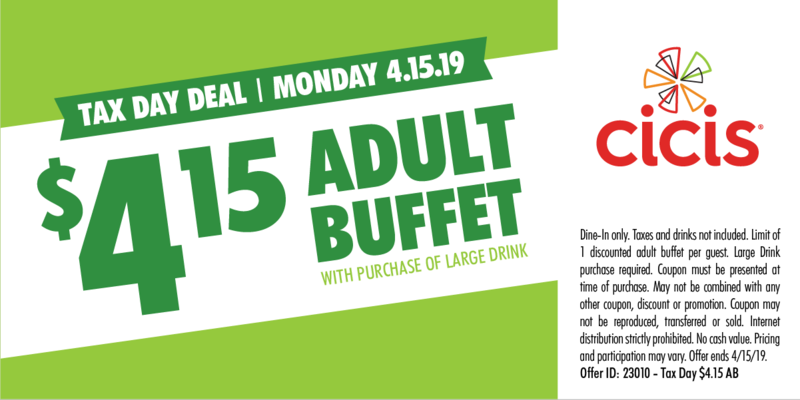 Adult buffets are just $4.15 with the purchase of a large drink when you present this coupon. Check White Castle's social media pages for a coupon that will get you 15% off any in-store order. DQ is loading up its app with tons of deals, like buy-one-get-one for $.99 Treatzza Pizza, $2 cake shakes, BOGO kids meals, free medium soft drinks with any burger purchase, and buy-one-get-one for $.99 Cupfections. Pick three items for $3.99 each when you're ordering food to-go over Easter weekend. You can pick from any of these: medium one-topping pizza, 24-count cheesy bread, 20-count cinnamon rolls, or 24-count of brownies. The deal takes place between April 19-21. Buy any pretzel item and get an original or cinnamon sugar pretzel gratis. Find the coupon online or in the Pretzel Perks app. Shout-out to Thrillist for the original list, which I have altered for local-specific restaurants.